Paris, in the early 70s: on the Avenue Montaigne, women would cross the threshold of the Dior boutique just for a perfume or a pair of bottoms. Often, they were accompanied by a man or a friend, or perhaps their daughter as well. That little girl stopping and gazing in awe at the storefront? 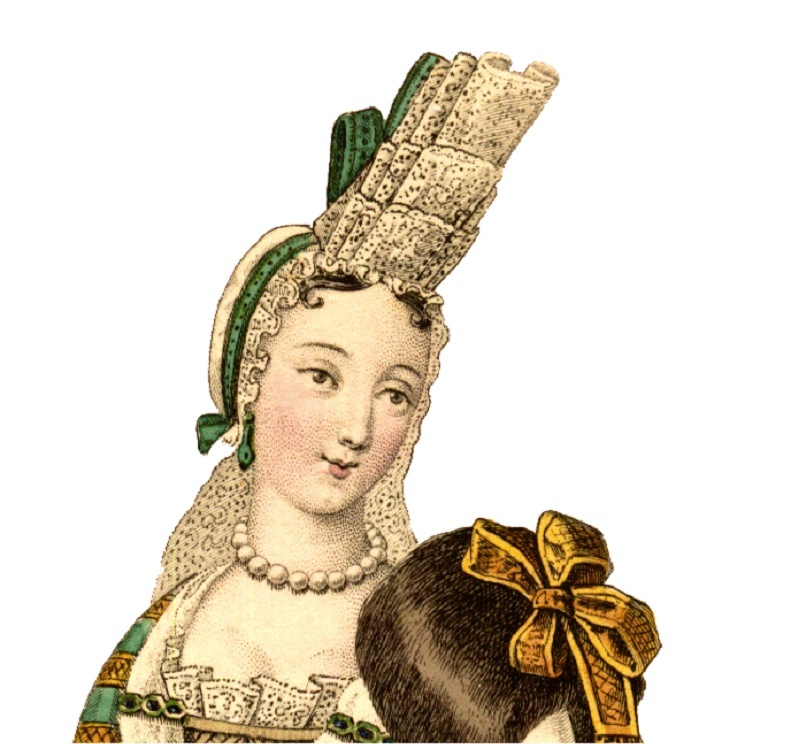 Victoire de Castellane. As a child, the grey pearl, the moldings, the Fontanges knot, and the “cannage” motif that covered the Napoleon III chairs would resonate with persistent fascination for her. Today, the designer is once more drawing on one of the brand’s trademarks, braiding the “cannage” motif into a number of mysterious and refined pieces. My Dior is mine and mine alone. 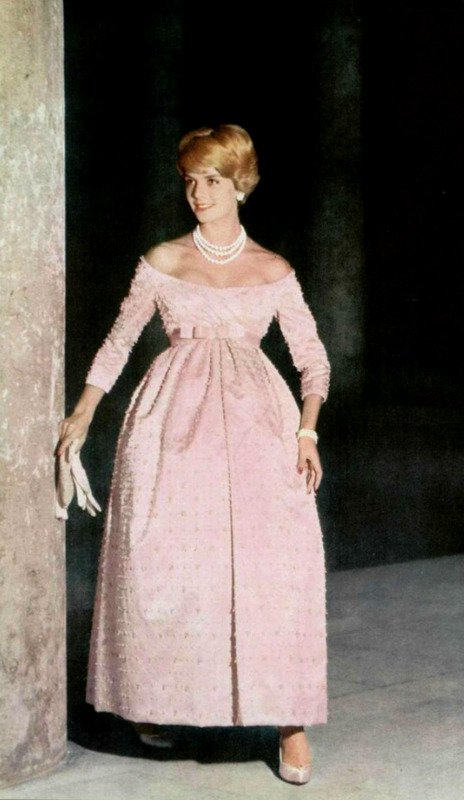 Victoire de Castellane is playing out Christian’s great loves here: Monsieur Dior’s first perfume was called Miss Dior. Her memories started like a melody that would never leave the brand; yesterday just as today, its glamour has character and is determined to asset itself. A new chapter for the great story behind “cannage” is beginning at Dior. Within this motif can be found a surprising degree of delicateness and refinement. On rings, bracelets, or cuffs, the twisting threads and garottes give a new dimension to the design. The chiseled detailing adds to this jewelry’s powerful finesse. The work is absolutely that of a jeweler: the lost wax fount technique boosts the soul of this collection in ways that only the hand of man knows how to. It’s poetry in every sense. With these stylish pieces, the Dior ateliers have signed off on a timeless classic, emblem of a specific idea for the Dior woman. Natural or sophisticated. Classic or modern. 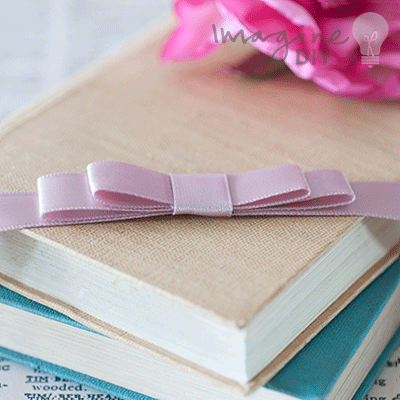 Always refined… If only Christian Dior could see them! 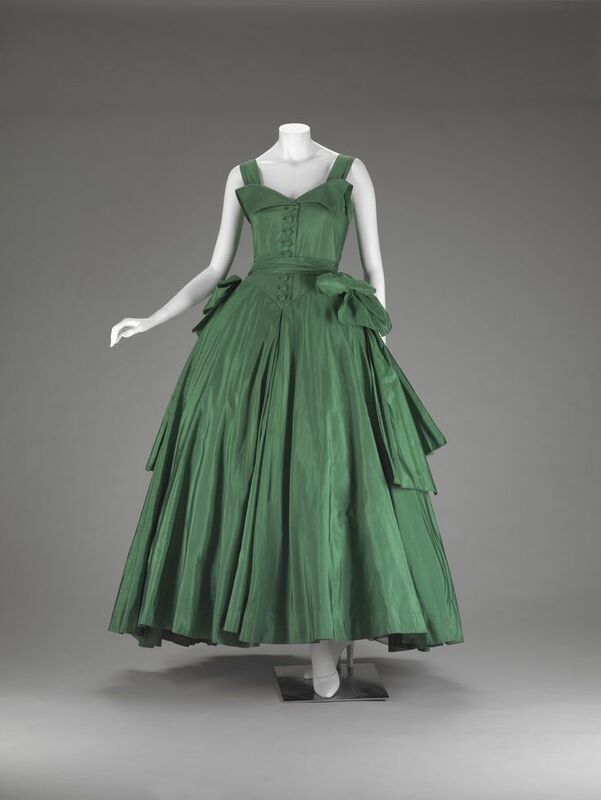 1947 : On the account of his interest in art and history Dior studied many artistocratics from the past such as Marie Antoinette or the Duchess of Fontanges, famous for knots and ribbons on their dresses. But the official debut of a knot as a code of the maison Dior is offered by the artist René Gruau. 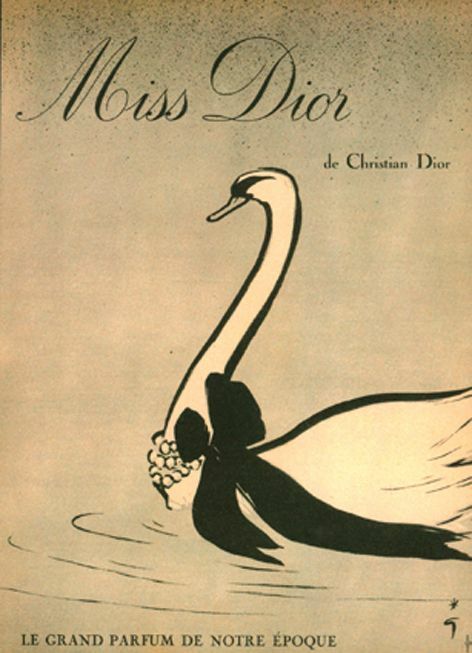 For the first official advertising campaign of the new fragrance «Miss Dior» he chooses a swan with a black knot in satin gently adorning his neck. 1948 – 1949 : Gowns and tailleurs are now adorned by flowers, flowery knots, childish knots and bows that remind those from the package of a gift, a candy or the wings of butterflies. 1950 : Christian Dior decides to radically twist Miss Dior’s bottle. A childish bow makes its appearance on the bottle. Knots become an iconic signature of Christian Dior. 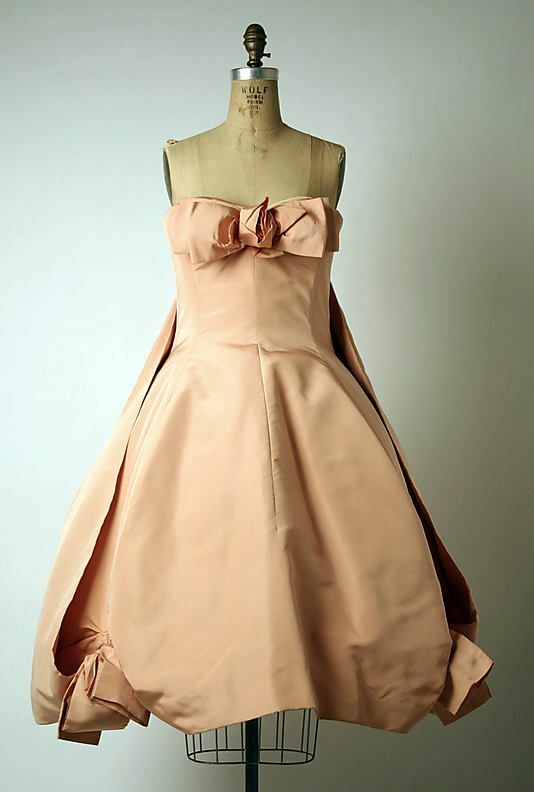 1950 – 1960 : It’s during the 50s, that Dior invents its own knot. It’s made of 2 or even 3 layers of fabric stitched one on the other, so to add a touch of unique femininity and frivolity. 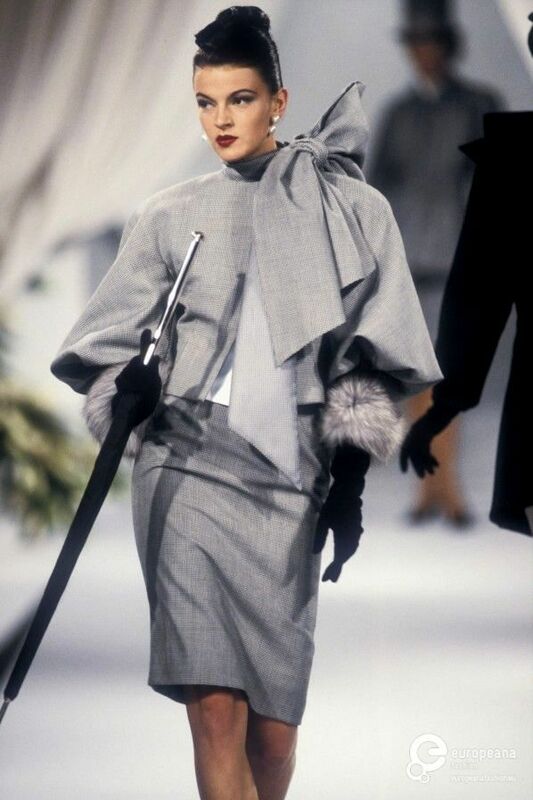 1957 – 1998 : Knots keep being protagonists under Yves Saint Laurent, Marc Bohan and Gianfranco Ferrè creative direction. 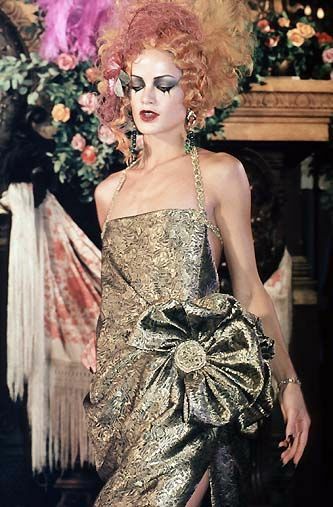 1998 – 2012: With John Galliano knots truly bloom. 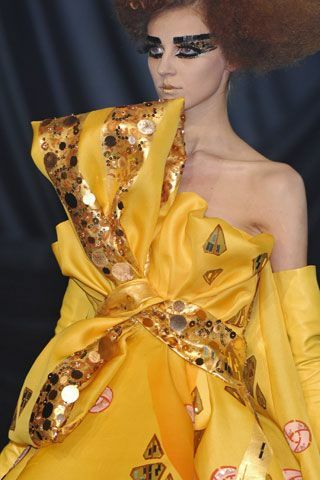 2009 : On the occasion of the Spring/Summer collection Galliano uses knots as a core subject for the new line. 2010 : The creative director of the jewellery segment, the master Victoire de Castellane, gives birth to a special ring named «Tralala». 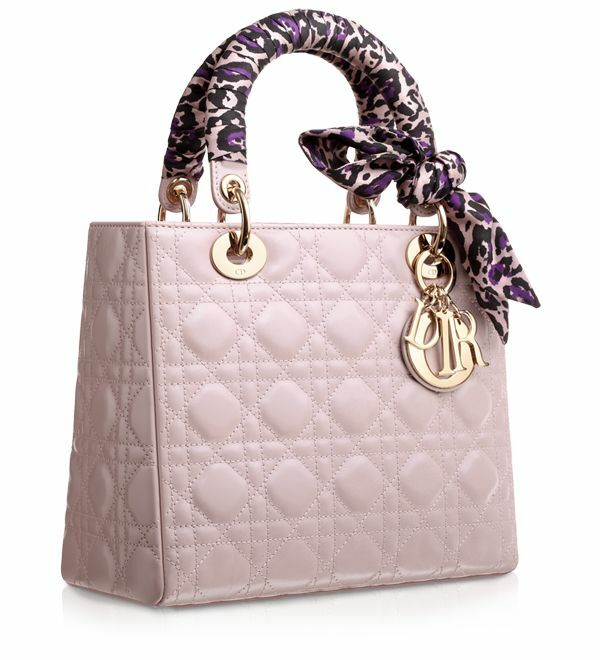 2012 : The knot makes its first appearance on the iconic Lady Dior bag. 2013 : The famous American actress Jennifer Lawrence is chosen by Dior as a new muse for Miss Dior fragrance. Just like the 1947 swan from René Gruau Jennifer Lawrence appears in a delicate pose with the neck surrounded by a black knot. 2013 : Dior’s knots are again protagonists on the occasion of the great exhibition dedicated to «Miss Dior» fragrance at the Grand Palais in Paris. 2013 : During the great exhibition for «Miss Dior» the artist Nika Zupanc creates a work of art which is an ode to Dior’s knots and cannage. 2016 : Dior gives birth to an absolute special edition of the fragrance «J’adore». For this capsule collection Victoire de Castellane, imagines a bottle of perfume directly inspired to Versailles. The bottle’s neck is embraced by an hand-scuplted Fontanges knot in precious metals. 2016 : Dior starts a project of jewellery inspired to Versailles royal palace. The common trait of the jewels collection is the Fontanges knot. 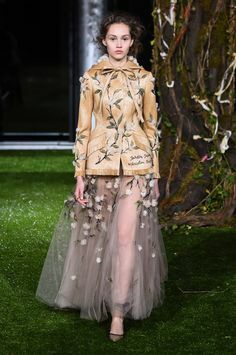 2017 : With Maria Grazia Chiuri Dior knot becomes a simple, essential garment, mixed with streetwear, new trends from the millennials and multicultural cross-fertilization. 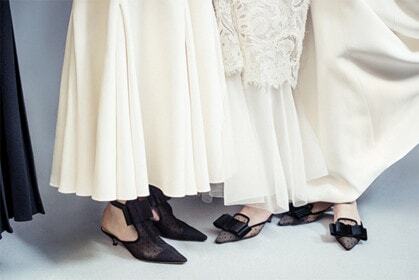 And For the Haute-couture collection Spring/Summer ribbons appear on the shoes.